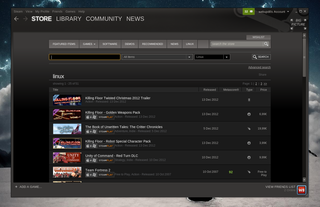 Valve has announced that Steam for Linux is now open to all users. The Steam for Linux beta client is now available to all Steam users, so if you've been patiently waiting for an invitation to join us, consider yourself officially invited! With a growing catalog of Linux-supported games, an active Steam for Linux community group, and a new GitHub bug reporting repository, the timing’s right to jump in and share your feedback. If you've already downloaded and installed Steam for Linux beta, you should redownload and install the latest deb available on its website, because Steam now has its own Ubuntu repository that's going to be used for updates. Well, at least in theory, because as soon as I've installed the new deb and launched Steam, it started to download an update through the client. Supported games include Serious Sam 3: BFE, Team Fortress 2, Killing Floor and others. For a list of games supported by Steam for Linux, see THIS page.